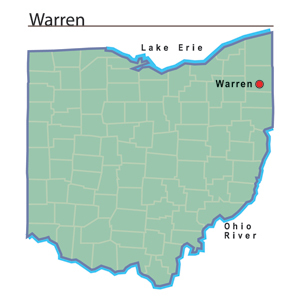 Warren is the county seat of Trumbull County, Ohio. In 1801, Ephraim Quinby established the town. Residents named the community in honor of Moses Warren, who surveyed the town. Warren had a population of nearly 1,600 people in 1846. In that same year the town had five churches, twenty stores, three newspaper offices, one bank, one woolen factory, and two flourmills. In June 1846, a fire destroyed several buildings on one side of the town square, but residents soon replaced them with new stores and other businesses. Warren became an important center of trade for farmers living in the surrounding countryside during this period. During the latter decades of the nineteenth century and throughout the twentieth century, Warren remained an important trading and manufacturing center. By 1888, four railroads connected the community with other parts of Ohio. In that same year, there were five newspaper offices, seven churches, three banks, and numerous manufacturing firms in Warren. The businesses manufactured a wide variety of products including linseed oil, furniture, barrel staves, wool fabric, blinds, and carriages. Warren's population was 5,973 people in 1890. Warren continued to grow in the twentieth century. During the late nineteenth and early twentieth centuries, steel production was a major industry in the county because of large deposits of coal and iron ore in surrounding counties. In recent years, many Warren residents have worked in local service and retail sales businesses. In 2000, Warren was Trumbull County's most populated community, with 46,832 residents.